It Came From the Workshop: Mooltipass Nearing Production! I am a Beta Tester for the Mooltipass offline password keeper (an open-source project) and last I posted I had received the hardware for testing. There is news! Beta Testing has been at times a lot of work, but I did my share helping troubleshoot and test (I even collected a bug bounty for finding a bug in a late near-final version.) I am happy to say that the Mooltipass has become something I use and rely on daily. It is an excellent tool that I can recommend happily. 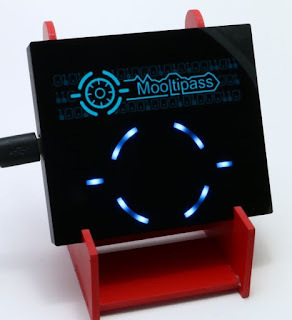 The Mooltipass firmware is finalized, other development is almost done, and production is almost ready to start. That means that you will soon be able to buy your own Mooltipass. In the meantime, the project creator has posted his own thoughts about having managed the project if you would like to know more about that end of things. Note: this post originally stated that the Mooltipass had entered production,but that is not yet quite true. The firmware is complete and the job of Beta Testers is (for now) done.